Despite the return of the mace less than 24 hours after it was stolen from the upper legislative chamber, the Senate Thursday insisted that the plotters and perpetrators of the invasion of its chamber must not go unpunished. 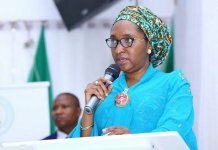 It also resolved to summon the Inspector General of Police (IG), Mr. Ibrahim Idris, and the Director-General of the Department of State Services (DSS), Mr. Lawal Daura, to brief it on investigations into the incident. The Senate on Wednesday was invaded by thugs loyal to suspended Senator Ovie Omo-Agege during plenary. The hoodlums carted away the mace, the symbol of authority of the Senate. The invasion, which lasted for a few minutes, caused commotion in the National Assembly and sent shock waves across the country. The plot to invade the chambers and cart away the mace was allegedly concluded on Monday night at a meeting by the now proscribed Parliamentary Support Group (PSG) made up of ardent supporters of President Muhammadu Buhari, who had vetoed the Electoral Amendment Bill last month. The Electoral Amendment Bill, which is proposing a change in the sequence of elections conducted in the country, is believed to be at the root of the invasion on the National Assembly. The National Assembly last February had changed the order of the elections for the presidential poll to be conducted last. The amendment to Section 25 of the Electoral Act provides for the National Assembly polls to be conducted first, followed by governorship and state Houses of Assembly elections, and then the presidential poll, all on separate days. 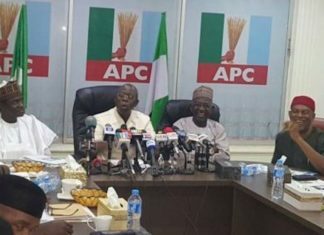 Some senators who later metamorphosed into the PSG, led by Senator Abdullahi Adamu (Nassarawa, APC), had kicked against the amendment, with Omo-Agege claiming the motive was targeted at weakening Buhari in the 2019 polls. Addressing the media, he had also claimed that the Senate and the House of Representatives did not follow laid down procedures in amending the bill. His comment led to his suspension from the Senate for 90 legislative days, and culminated in Wednesdayâ€™s invasion, which saw the thugs escape from the premises with the mace. However, the police Thursday said it had recovered the mace, saying that the hoodlums who stole it from the National Assembly had dumped it under a flyover in Abuja. According to the Police Deputy Public Relations Officer, SP Aremu Adeniran, â€œSequel to the invasion of the Senate chamber of the National Assembly on April 18, 2018 by some suspected thugs who disrupted the Senate plenary session and carted away the mace, the Inspector General of Police, Ibrahim K. Idris immediately instituted a high-powered police investigation and intelligence team coordinated by the IG monitoring unit of the force and further directed a total lock-down of the Federal Capital Territory with intense surveillance patrol and thorough stop and search operations at various police check-points with a view to arresting the perpetrators and possible recovery of the stolen mace. Adeniran stated that â€œwhile a discreet investigation into the incident is still ongoing to arrest and bring the perpetrators to justice, the Nigeria Police Force appreciates the spirited members of the public, most especially motorists within Abuja metropolis for their support, cooperation and timely information during the rigorous stop and search operations for the recovery of the maceâ€. However, after taking possession of the mace Thursday, the Senate after a closed door meeting insisted that those who plotted, aided, abetted, and executed the invasion, must be made to face the full wrath of the law. Omo-Agege, who on Wednesday had maintained that he attended plenary because his suspension could not stand, was however absent Thursday. The Deputy President of the Senate, Senator Ike Ekweremadu, in his address after executive session, said the desecration of the mace was a sad testimony, a derogation and smear on Nigeriaâ€™s democracy. He confirmed that the mace had been recovered and returned, in line with the resolution of the National Assembly mandating the Police IG and DG, DSS to ensure its recovery in 24 hours. â€œNevertheless, we believe that there should be consequences for bad behaviour. It still beats the imagination of Nigerians and the civilised world that the attackers passed through the several security checks and barriers into the National Assembly and the inner recesses of this chamber, and also escaped with the mace into thin air, despite the well-known fortified surroundings of this parliament. â€œTherefore, we hold that it will be a detour to the state of nature where life was lawless and brutish, if what happened yesterday (Wednesday) is allowed to go unpunished, or to be swept under the carpet. â€œIt will never happen. We will get to the root of the matter. We call on the Inspector General of Police and Director-General of the State Security Service to ensure that all those who plotted, aided, abetted, and executed this dastardly affront on our democracy and belittled Nigeria before the international community must be brought to book to serve as a deterrent to others,â€ Ekweremadu said. The Deputy Senate President said the invasion also brought to fore, the clamour for a decentralised police system, lamenting that the security of the National Assembly was fully outside its control. Ordinarily, a big institution like the National Assembly should have its own police, apart from the Sergeants-at-Arm, he said. â€œI want to assure Nigerians that we will never waiver in the responsibility they have elected us to shoulder. We will all stand together to defend this institution of the parliament and our democracy. We will never fear to legislate and we will never legislate out of fear,â€ he said. Ekweremadu lauded his colleagues for their maturity in the face of the flagrant provocation. â€œI want to also specially appreciate the leadership and members of the House of Representatives, the management and staff of the National Assembly, especially our chamber staff for their gallantry. â€œWe appreciate Nigerians, the media, civil society, political parties, and the international community for the outpouring of solidarity and concern. 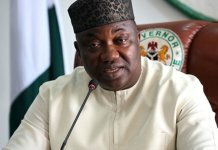 â€œUgly and provocative as the event of thursday was, it soothes that the entire nation and the world stood together in total condemnation of the ugly drama, brigandage, and desecration of the National Assembly by those who hold themselves above the laws and institutions of our land,â€ Ekweremadu added. 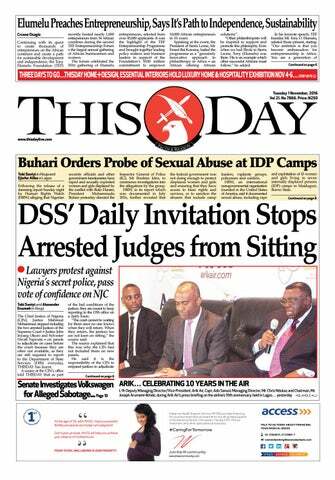 THISDAY gathered that the executive session of the Senate was very heated as some senators were said to have verbally attacked the members of the PSG for the invasion of the hallowed chamber and the seizure of the mace. â€œWe told them that what they did yesterday was a thorough embarrassment to the nation where they are called leaders and â€˜Distinguished Senators,â€ a senator told THISDAY off the record. The senator further disclosed that Senator Dino Melaye was particularly miffed when some lawmakers called for the review of the security structure of the National Assembly. â€œDino queried the sense in the idea when the current one in place was sabotaged from within. He argued that unless the issue itself, which some want to shy away from, is addressed, the place cannot be secure. 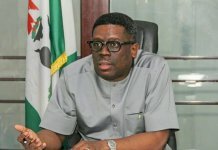 â€œDino also alleged that the PSG still held a meeting last night after all that had happened,â€ the senator also revealed. Another senator said most of his colleagues had called for harmony and for all contentious issues to be resolved. Meanwhile, Omo-Agege who has been identified as the alleged mastermind of the invasion on the National Assembly and theft of the mace, said Thursday that he was never arrested by the police on Wednesday. Omo-Agege, an ardent supporter of the president, was whisked away by the police from the National Assembly on Wednesday. However, he was let go a few hours later, raising suspicions that the IG was under pressure to let him go and not to press charges against him. After his release on Wednesday, his aide also said that the senator was not involved in the invasion of the National Assembly and theft of the mace from the Senate. Speaking on his brief visit to the FCT Police Command, Omo-Agege in a tweet Thursday, said he â€œmerelyâ€ left with the police who wanted to hear his perspective on the matter. The senator said after he had given his perspective of what transpired, he â€œimmediatelyâ€ left the police. â€œFOR THE RECORD; I was never arrested!!! I merely left with the police who wanted to hear my perspective on the matter. Told them my perspective and left immediately after,â€ Omo-Agege who posted a picture of himself smiling, tweeted. However, despite his claim of innocence, Omo-Agege, a qualified lawyer, proceeded to an Abuja High Court where he got a restraining order against the police and DSS from arresting him. The Chief Judge of the Federal Capital Territory (FCT) High Court, Justice Ishaq Bello, gave the order Thursday in an ex parte application granted to the applicant. His counsel led by Aliyu Umar (SAN) approached the Abuja High Court for an order of the court restraining the government and its agencies from arresting him. Respondents in the suit are the Attorney General of the Federation(AGF), IG, Commissioner of Police, FCT Command, and the Director General, State Security Service. In the ex parte application filed and granted by the court, the respondents have been restrained from arresting or detaining the senator. The court also restrained the respondents from any attempt or threat to violate the applicantâ€™s rights to personal liberty and right to freedom of movement, pending the hearing and determination of motion on notice filed in the suit. 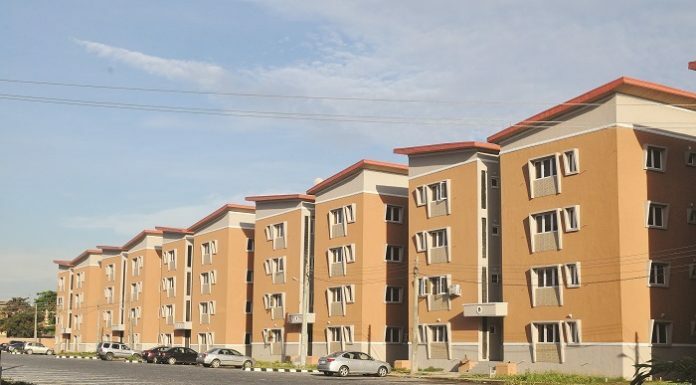 The court further restrained the respondents from taking any further steps detrimental to the fundamental rights of the applicant in connection with the facts stated in the matter, pending the hearing of the motion on notice filed in the suit. Justice Bello adjourned till May 7 for the motion on notice to be argued before Court 30 where the case was assigned.